Brain Gigantic 43cm under a microscope! The three-pound brain inside your head is your mind, your personality and your body’s boss. From speaking and seeing, to thinking and remembering, your brain controls what you do! The human brain is the most hopeful thing there is. It provides original thoughts, ideas and emotions. With it you can write books, run a race and create music. 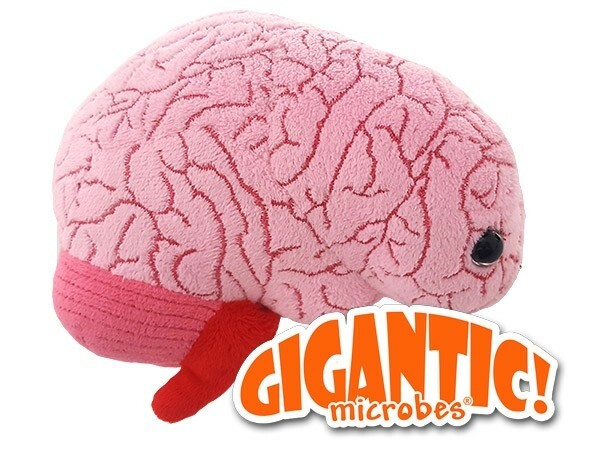 Be smart and check out this adorably realistic brain today! 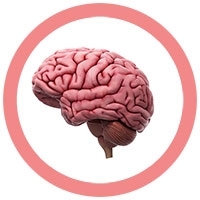 FACTS: The soft, wrinkled three-pound brain inside your head is your mind, your personality and your body’s boss. From speaking and seeing, to thinking and remembering, your brain controls what you do. Can you imagine 10 billion neurons sending out trillions of messages every minute? You certainly can because your brain gives you an incredible imagination! But the brain takes a lot of energy to do its job, even just to read this card. It uses 25% of all the nutrients you eat and 25% of the oxygen you breathe. Making up only about 2% of your body’s weight, for its size the brain uses ten times more energy than most other body parts. After many centuries of research and study, our brain still doesn’t know very much about itself. The brain is the most complicated part of the human body, and perhaps the most amazing structure in the entire universe. We have learned some things about its three main parts: on top is the cerebrum for thinking, learning and feeling; to the rear is the cerebellum for moving the body; and below is the brain stem for controlling breathing and other automatic processes. There is no single place in the brain where you think and remember. These processes are spread out among many parts and billions of nerve cells. These neurons have spidery-looking extensions called dendrites and axons that link together at synapses. Tiny electric pulses pass through this nerve network, carrying information around the brain and body. If you remember what you are reading here, then your brain is doing a good job making new circuits between nerve cells. The human brain is the most hopeful thing there is. It provides people with original thoughts, ideas and emotions. Your brain lets you concentrate, daydream and learn. With it you can write books, create music, run a race and solve complex problems. So thank your brain for being so powerful and inventive, and for making you who you are!